The objective of this land cover mosaic is to provide a data product that characterises the detailed land cover of a significant portion of the BOREAS Region. Seven Landsat-5 TM images have been assembled to completely cover the BOREAS Transect. Entire TM scenes were used to create this land cover map. A detailed classification scheme was employed, permitting the extraction of virtually all land cover information that can be discerned from digitally enhanced TM images. The data are provided in a binary image format file. Beaubien, J., R. Latifovic, J. Cihlar, and G. Simard. 2001. 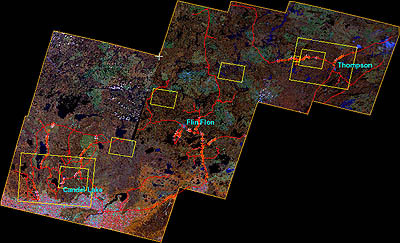 BOREAS Follow-On DSP-01 Landsat TM Land Cover Mosaic of the BOREAS Transect. Data set. Available on-line [http://www.daac.ornl.gov] from Oak Ridge National Laboratory Distributed Active Archive Center, Oak Ridge, Tennessee, U.S.A. This data set provides land cover description for a significant portion of the BOREAS Region, by employing 7 Thematic Mapper (TM) scenes that collectively span the BOREAS Transect between the Southern and the Northern Study Areas (Sellers et al., 1995). The land cover is characterised as belonging to one of 29 land cover classes (section 7.3.2). A detailed classification scheme was employed, permitting the extraction of virtually all land cover information that can be discerned in digitally enhanced TM images. However, it should be noted that this classification does not include a separate category for wetlands. This is because wetlands in this region are generally composed of grass and/or shrub cover that can have very similar spectral reflectance characteristics to non-wetland shrub and grassland classes and it is extremely difficult to discern the two with single-date imagery. This classification was produced for BOREAS Follow-on investigators who needed a land cover data set with which to compare other measurements. It is an improved version of a 6-scene mosaic described by Beaubien et al (1999). The objective was to map land cover at the highest level of detail possible with TM data, especially for the forest. This was achieved by a series of pre-processing and classification steps, so that all the land cover detail discernible in digitally enhanced images could be retained for preparing the land cover map. The objective of this land cover map is to provide BOREAS regional scale modellers with a product that characterises the land cover for a significant portion of the BOREAS Region at the TM scale. An unsupervised classification technique was used, preceded by several pre-processing steps to facilitate the extraction of all relevant land cover information. Satellite sensors measure radiation reflected or emitted by land surface cover and its components. The assumption behind this approach to land cover mapping is that the reflected solar radiation is highly correlated with differences in land cover that are of interest to investigators studying land cover processes. The Landsat-5 Thematic Mapper (TM) sensor system records radiation in the visible, near-IR, and thermal wavelengths. See BOREAS TM documentation for additional details. Landsat-5 orbits the Earth at an altitude of approximately 705 kilometres. The mission of the Landsat-5 satellite is to measure reflected radiation from Earth's surface at a spatial resolution of 30 meters and to measure the temperature of Earth's surface at a spatial resolution of 120 meters. The TM is a scanning optical sensor operating in the visible and infrared wavelengths. It contains a scan mirror assembly that directly projects the reflected Earth radiation onto detectors arrayed in two focal planes. The TM depends on the forward motion of the spacecraft for the along-track scan and uses moving mirror assembly to scan in the cross-track direction (perpendicular to the spacecraft). The Instantaneous Field of View (IFOV) for each detector from bands 1-5 and band 7 is equivalent to a 30-m square when projected to the ground; band 6 (the thermal-infrared band) has an IFOV equivalent to a 120-meter square. The absolute radiometric calibration between bands on both sensors is maintained by using internal calibrators that are physically located between the telescope and the detectors and are sampled at the end of a scan. 2        0.526 -  0.615      Green reflectance by healthy vegetation. 4        0.771 -  0.905      Biomass surveys, water body delineation. 7        2.083 -  2.351      Hydrothermal mapping. Relative within-band radiometric calibration, to reduce "striping", is provided by a scene-based procedure called histogram equalisation. The absolute accuracy and relative precision of this calibration scheme assumes that any change in the optics of the primary telescope or the "effective radiance" from the internal calibrator lamps is insignificant in comparison to the changes in detector sensitivity and electronic gain and bias with time and that the scene-dependent sampling is sufficiently precise for the required within-scan destriping from histogram equalisation. Each TM reflective band and the internal calibrator lamps were calibrated prior to launch using lamps in integrating spheres that were in turn calibrated against lamps traceable to calibrated National Bureau of Standards lamps. Sometimes the absolute radiometric calibration constants in the "short-term" and "long-term parameters" files used for ground processing have been modified after launch because of inconsistency within or between bands, changes in the inherent dynamic range of the sensors, or a desire to make quantized and calibrated values from one sensor match those from another. In general, the data quality was acceptable from the atmospheric transparency viewpoint, except for scene Path 33/Row 31 which appeared to be hazy over its SW part. Significant radiometric differences were also apparent as a result of seasonal (day of acquisition) and interannual differences, most likely due to varying precipitation regimes. These differences were dealt with at the classification and labelling stages. Field observations were collected as part of the accuracy assessment procedure (refer to section 10.2.1). The seven images cover an area of 142854.15 km2, over 159 million pixels, 30 metres by 30 metres in size, and include both the BOREAS Southern and Northern Study Areas. Because of the orbital geometry, a small area between images Path/Row 37/21 and 35/21 was omitted when the images were selected. Each pixel represents a 30-meter by 30-meter area on the ground. The data are referenced to the projection described in section 7.1.4. (Equivalent Deg,Min,Sec)    :   0° 00' 01.65"     0° 00' 01.03"
Each TM scene was collected at a single point in time as indicated in section 7.2.2. The classification scheme was designed to meet three objectives: 1) retain as much information about land cover in the Region as possible, especially regarding forest types and conditions; 2) be compatible with other classifications employed by boreal ecosystem investigators; and 3) be applicable to Landsat TM (i.e. all the necessary information to differentiate between the classes should be available in a single-scene TM image). Two sets of pixel values are shown for each class. The number preceding the class name refers to the final classification, each class having a unique identifier. The second set of numbers (after the name) refers to spectral clusters that have been agglomerated to produce the final class; they thus provide additional (spectral) information. Note that the file "tm_mosaic_cls1" (section 8.2.1) contains the first set of pixel identifiers, and the file "tm_mosaic_cls2" contains the second set. The class descriptions follow below. Note that the sole purpose of the numbering scheme used here is to indicate the hierarchy among the categories. This class, especially prevalent in the Northeast portion of the mapped area, contains older black spruce (BS) forest (older than ~40 years). This class is also dominated by old black spruce forest, like 1.1.1, but is more widely spread in the region and commonly includes jack pine (JP) trees; if desirable, 1.1.1 and 1.1.2 may be merged. As most of this region was repetitively burned in the past, this class is particularly dispersed in the area. It may contain a small proportion of broadleaf species (<20%) and some jack pine stems; ëyoungerí refers to approximately 20-40 years. In this region, medium crown density forests are generally young (~ 20-40 years). It should be noted that the species (BS or JP) may influence the apparent density. For example, a dense (>60%) jack pine stand may be part of a medium density class because of the foliage pattern and the influence of the ground cover (particularly lichens) more easily apparent then under a dense black spruce stand. Typically, a jack pine forest on a drier site with lichen commonly present in the understory. Lichens may also be present, but generally has a green understory; this class is particularly widespread in the region. Generally located on more humid sites, this class can include a small proportion of broadleaf species. Commonly located on wet sites with a proportion of broadleaf vegetation (mostly shrubs); occasionally young tree canopy after older burns (> 10 years). Lichens commonly present in the understory; occasionally this class is located in burned areas with mixed cover (dead stems, bare soil, rock outcrops); an understory with abundant lichens seems to lower the apparent density. There is confusion in this class with some dried-up wetlands. Commonly located on wet sites with a proportion of broadleaf vegetation (mostly shrubs) in the southern portion of the region; in the northern areas, some regenerating cover after burns. Almost exclusively in the southern part of the area; elsewhere some rare younger, dense broadleaf cover (or high shrubs) can be in this class. Mainly in the southern part of the area in the vicinity of high-density deciduous forest; transitions between high and medium densities may frequently occur locally; the density values refer mainly to the dominant broadleaf trees; some conifers may be present in lower strata. After perturbations (fires), this class may combine young and short broadleaf cover with possible conifer regeneration. Mostly in the southern part of the area, after perturbations such as previous cut-overs, burns, and cropland areas with shrub cover. Mainly among southern mixed forest, some patches exist in northern old burns (>10 years). Mainly young forest cover in northern old burns. Mainly located in the southern part of the area within high crown density deciduous forest class of high crown density. Among southern broadleaf and mixed forest cover, but also numerous patches of young forest cover after old burns in northern areas. Typically contains wetlands in southern areas; very few patches after more or less recent burns; some trees can be present. Note that some TM scenes predate fieldwork by up to seven years; during this period, vegetation on burns has regenerated. Dead standing stems are commonly present. Confusion exists with some patches of medium density jack pine cover class with lichen understory, class 22. Rock outcrops with very sparse vegetation after burns. Conifer regeneration can be present; also some patches of open land with partial green vegetation, like some wetlands. Conifer regeneration can be present; also some patches of similar cover within wetlands. Also mixed low cover in wetland areas. Very sparse vegetation cover, mainly located in areas recently disturbed by cut-overs in the southern portion of the area. This class with sparse vegetation cover is located mainly in areas recently disturbed by cut-overs in the southern part of the area; a few exceptions are some patches in burned areas; conifer regeneration can be present (recall the acquisition dates of the imagery). No attempt was made to differentiate crop types, because the primary interest is forest cover, and the varying acquisition dates make crop identification difficult. The categories below refer broadly to different crop types, but the phenological differences cause large confusion. Land Cover type - coded but unitless value. Manitoba Department of Natural Resources, Provincial Forest Inventory Maps. These maps are compiled from aerial photographs at a scale of 1:15,840. Each map covers an area of about 93 km2. Maps identify stands by number, assigned within each map; a separate legend sheet for each map provides details about each stand. Saskatchewan Department of Tourism and Renewable Resources, Inventory Maintenance Maps. These maps are compiled from aerial photographs at a scale of 1:12,500. Each map covers a 10x10 km area. Stand information code on the map include stand number, species age, height, and canopy information. Pixel values of 0 to 162, stored as 8-bit integers. The smallest amount of data that can be ordered from these data is the entire data set. The classification product contains two image files, each are unsigned 8 bit binary files, with a size of 23341 pixels by 14139 lines. tm_mosaic_cls1.img: Classified image with values from 1 to 150 with zero values (0) used as fillers for non-image (no data) areas of the image: contains a unique identifier for each final class (refer to section 7.3.2). tm_mosaic_cls2.img: Classified image with values from 1 to 150 with zero values (0) used as fillers for non-image (no data) areas of the image: contains a unique identifier for each spectral cluster; one or more clusters were merged to form the final classes (refer to section 7.3.2). The intent was to obtain land cover classification compatible with the BOREAS experimental period (1994-1996). Given the limitations of data availability (primarily due to cloud cover), images from several years were used. For the most part, the resulting classification is representative of land cover during BOREAS because of the low rate of land cover change during the 1990's. The selected images are listed in section 7.2.2. A new radiometric normalisation procedure was used to establish radiometric consistency among the seven TM scenes. The principle of the method is to employ overlapping sections among the scenes, assuming that there are at least some areas within these whose reflectance properties have not changed between the imaging dates (Du et al., 2000). The procedure avoids any loss of radiometric detail during the normalisation, and ensures consistency across the entire mosaic, regardless of the sequence of scenes in the mosaicking. The purpose of the enhancement is to bring out the distinctions among various classes of interest so that they can be more easily viewed in the subsequent steps. It is carried out in three steps: viewing of the data, sampling of cover types with low and high values in each spectral band, and digital stretch. The purpose of this part of the process is to produce a first classification, which captures most of the information visible in the initial enhanced image. A K-Means method (Tou and Gonzales, 1974) was used to classify the stretched image into 150 clusters. After computing a pseudo colour table (PCT) for the enhanced image, the classified image closely resembles the enhanced input image. A second level of generalization is reached by a re-classification from a selection of the more significant signatures generated by the unsupervised classifier. This is carried out in three steps, first, by image filtering (mode and sieve filters) to "flatten" the image by making classes more uniform over groups of spatially adjacent pixels. The next step includes selection of all visible (thus more significant) cover types. Lastly, a minimum distance classification on the initial enhanced image according to the signatures of the selected cover types. To reduce the number of clusters before manual agglomeration, those three steps are optionally repeated. After each iteration, the classification results are carefully compared to the initial unsupervised classification, using the same pseudo-colour table. Other signatures may be added if suitable. The purpose of this step is to group spectral clusters representing the same ground cover types. Since the last classified image closely resembles the original image, where image colours associated with the basic cover types are known, a substantial degree of agglomeration can be completed on the basis of colour patterns. Additional tools may include examination of the cluster mean digital value through a distance table, and spatial proximity values between clusters. For the remainder, independent knowledge of ground conditions in specific areas is required, as in other classification methods. Refer to PCI CSG and MLC programs. This classification does not include a separate category for wetlands. This is because wetlands in this region are generally composed of grass and/or shrub cover with different heights, densities, and the ratios of live-to-dead leaf biomass. Consequently, they can have very similar spectral reflectance characteristics to shrub, grassland, and some burn classes. It might be possible to use late spring images as an additional data source because surface water should have a stronger influence on the spectral reflectance. Alternatively, radar images might be helpful. However, such differentiation does not appear to be feasible with a single-date TM image taken during the growing season. Thus, most wetland cover types are in the shrub and grassland class (85), and some are contained within the burn classes (81, 64, 35). A similar situation is present in the southern part of the mosaic where grass fields in agriculture area are classified as class 81. BOREAS auxiliary sites 'B': these sites were carefully documented using aerial photographs, and described in the field using forest mensuration and site description methods (Halliwell and Apps, 1997). A total of 55 sites were documented in this manner. Additional sites: in late September and early October of 1998, a field survey was undertaken to obtain additional data for accuracy assessment. Due to access limitations and the large area to be covered, the criteria for site locations were the representativeness of the various forest classes and conditions, sufficiently large patch size (to compensate for potential geolocation uncertainties), and proximity to the existing road network. This was accomplished by pre-processing the mosaicked TM image to locate spectrally homogenous patches, overlaying the road network, and printing the result at a large scale for use in the field. The above procedure resulted in a somewhat uneven distribution of test sites, as indicated in the table below, but further improvements were not feasible with the available resources. Two types of sites were used: 'S', sites with photographs (overstory, understory, horizontal view) and physiognomic descriptions (overstory, understory); and 'M', sites with a photograph (horizontal view) and vegetation class identification. The location of each 'S' site was established with a GPS, and each 'M' site by landmarks on the TM enhancements. A total of 94 'M' sites and 89 'S' sites were located across the region. In addition, high-resolution GPS point measurements were taken to facilitate accurate registration of the TM mosaic. For the accuracy assessment, each site from the BOREAS auxiliary site set and the additional set was assigned to one of the 29 classes, based on a consensus of two interpreters. The corresponding class on the map was defined to be the majority class occurring in the 3x3 window centred on the site. Based on the qualitative and quantitative accuracy assessments (section 10.2.1, 10.2.3), we have high confidence in the accuracy of the classification. As noted above, the main limitation is absence of a wetland class. In addition, accuracies could be lower in areas from which no field sites were located, e.g. areas farther from the existing road network. The following confusion matrix shows results of the accuracy assessment. It is evident that the overall accuracy is quite high. The confusion that did occur was mostly between adjacent density classes or the proportions of coniferous and deciduous classes. The overall kappa value (Congalton, 1991) was 0.8977 or 89.8% better than chance agreement. This image was viewed to make sure that it matched the product description and appeared to be a classification image of a part of the BOREAS region. The user should keep in mind that the original images were taken in different years. The class descriptions and the map accuracy should also be considered in using this product. Users should be aware of accuracy limitations as well as problems listed in Section 10. This land cover map was created to provide BOREAS regional scale modelers with a driver data set that characterises the land cover for a significant portion of the BOREAS region at a relatively fine scale. Various proprietary programs in the EASI/PACE image processing software from PCI, Inc. were used to classify the image. Zip uses the Lempel-Ziv algorithm (Welch, 1994) used in the zip and PKZIP commands. EASI/PACE is a proprietary software package developed by PCI, Inc. Contact PCI for details. Zip software is available from many Web sites across the Internet. You can get newer versions from the PKZIP Web site at http://www.pkware.com/download-software/ [Internet Link]. Versions of the decompression software for MS Windows, Mac OS, and several varieties of UNIX systems are included on the CD-ROMs. These data can be made available on CD-ROM. Friedel J. P., Fisher T. A. 1987. Mosaics - a system to produce state-of-the-art satellite imagery for resource managers. Geocarto International 2(3): 5-12. PACE Image Analysis Kernel Version 5.2. 1993. PCI Inc. Richmond Hill, Ontario. Richards, J. A. 1986. Remote Sensing Digital Image Analysis: An Introduction. Springer Verlag. Du, Y., Cihlar, J., Beaubien, J., and Latifovic, R. 2000. Radiometric normalization, compositing and quality control for satellite high resolution image mosaics over large areas. IEEE Transactions on Geoscience and Remote Sensing (submitted). Beaubien, J., J. Cihlar, G. Simard, and R. Latifovic. 1999. Land cover from multiple Thematic Mapper scenes using a new enhancement-classification methodology. Journal of Geophysical Research 104(D22): 27909-27920. Congalton, R.G. 1991. A review of assessing the accuracy of classifications of remotely sensed data. Remote Sensing of Environment 37: 35-41. Halliwell, D.H., and M. J. Apps. 1997. BOReal Ecosystem-Atmosphere Study (BOREAS biometry and auxiliary sites: locations and descriptions. Canadian Forest Service, Natural Resources Canada, Edmonton, Alberta. 120p. Tou, J.T., and R.C. Gonzales. 1974. Pattern recognition principles. Addison-Wesley Publishing Co.